More Holiday Knitting? Man Socks? and a rant about ribbing. Every year I end up knitting at least a few pairs of ?Man Socks?? aka plain, bland colored, utilitarian, simple, large socks. Each year it seems, they are for a different person, but nonetheless ? plain ribbed men?s socks. Ribbing is my arch enemy! My nemesis, as it were. I can knit complicated lace until the cows come home. Fast. But put me in front of a garment made up entirely of basic 1x1 or 2x2 ribbing, even seed stitch (that?s just alternating K and P? which is also Ribbing!) and I am paralyzed. Knitting ribbing seems to take eons. I know it?s likely all in my head, because I don?t have a problem switching between knit and purl for other things, but ribbing ? oh how I hate thee! Even though you look beautiful and orderly and elegant in your straight lines. Now don?t get me wrong? I know the recipient will love these socks, and they will get worn to pieces, and keep the lucky person?s feet nice and toasty ? but I find knitting plain men?s socks to be complete torture! I love it when I find a man who will accept a sock with a little cable in it, or a bit of a ?design? to it because I know I?ll be able to finish the more ?complicated? sock in half the time of the plain ribbing ones. I?ve knit lace socks with all-over lace in less time than knitting a small pair of plain ribbed ones. Maybe I just get bored with ribbing? where patterning keeps my brain active and I feel more engaged by the knitting? who knows. This pair is made from Belfast Mini Mills Merino/Nylon Blend Sock Yarn in a lovely bittersweet chocolate color. I found the yarn to be a bit splitty in the beginning, but I got used to it eventually. This is my improvised plain Man Sock? basically a toe up variety in 1x4 ribbing for everything except the sole, and of course a slipped stitch heel for some extra cushion. I used up the majority of 2 skeins? one per sock. With all of the crazy sock competition insanity going around... it was a very refreshing change to knit a plain pair of socks for a friend. 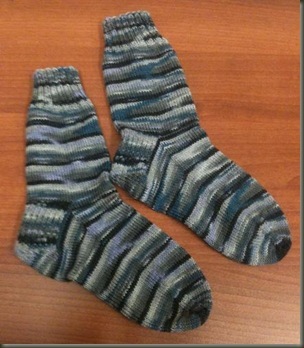 This pair was based on the most basic straightforward sock design I know. The parts are all familiar and reliable, and I can work each section without a pattern or too much thought. I don't even really need to watch my fingers anymore. - plain foot, tapered to 12 stitches and then kitchener stitch to finish. The yarn was Regia Galaxy "Saturn" in color 1578, basically a self patterning grey/green/purple yarn. It didn't exactly knit up in stripes, but almost that way. From what I gather the yarn is supposed to make stripy swirly patterns that resemble the look of a planet from space. Initially, I thought maybe the yarn was going to feel itchy and/or traditional style wooly, but it did seem to soften some during the knitting process. I chose to use this yarn specifically because of it's reputation for being tough. The ball band even goes so far as to state that the finished socks will be "machine washable up to 40 degrees C, no felting, dryer proof with 10 years Regia-Garantie" so I hope they live up to their promotion. 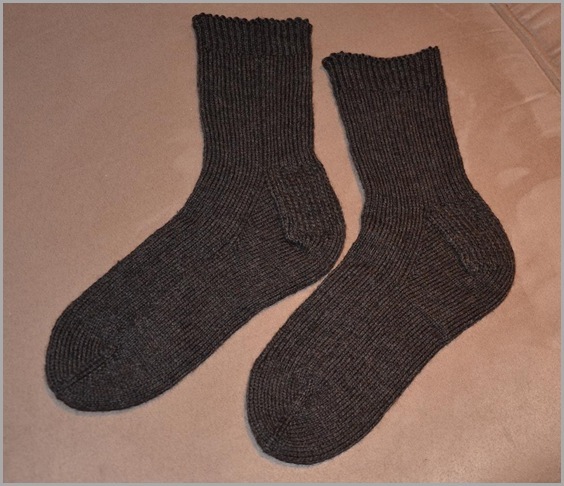 The finished socks were knit on 2.75 mm DPNs, and the fabric still felt nice and solid. 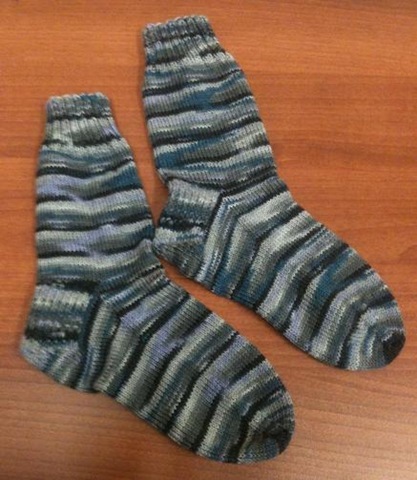 Even after being carried around in my purse for a week, there was no sign of any fuzzing or pilling (don't laugh, I had a pair I was making from Bernat Sox that were junk and looked like they had been worn for a year BEFORE I was even done knitting them!) I would definetly use Regia Products again, though I am not always attracted to the types of self striping/patterning yarns that they seem to be coming out with lately. I wasn't crazy about the pattern that the yarn made... but these socks are for a man, so it does look sufficiently like camouflage style print to still be acceptable (so says my picky husband who thinks socks should be all one color - Blasphemy says I) I didn't really do any special blocking on these, as you can tell, which doesn't make for great photos, but the recipient tells me they are warm and wooly, just the way he likes them!